Dr. Richard Webber is an attending general surgeon at Grey Sloan Memorial Hospital. He also serves as Residency Program Director and has served three separate times as Chief of Surgery. Richard Webber has been known to wear a casual piece of headgear time and again. Nearly always when he is not on duty at Grey Sloan Memorial Hospital. ​Most often, it’s his gray twill, bucket hat. It’s worth mentioning that Richard’s hat has the chin cord removed. Richard is frequently seen wearing one of several different jackets, including casual jackets, cardigans, formal jackets and of course his white lab coat. His jacket style is very casual and probably exactly what you might expect a middle aged gentleman to wear. When Meredith and the other surgeons realize that he’s gone back to drinking, they confront him and this leads to him resigning from his position as Chief of Surgery. Which he had held previously for twelve years. 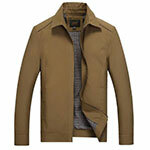 Here is a casual jacket in dark khaki color that is a great match to the jacket worn by Dr. Webber. ​This deep gray full-zip style cardigan is another nice match to the style and wardrobe of Richard Webber. Dr. Webber’s shirts are likely the most recognizable articles of clothing for when he holds the position of “Chief of Surgery.” As this position requires him to fulfill administrative duties as well as being the most senior surgeon. ​Spending more time in an office than the operating room obviously means that as “Chief”, he dons his signature navy scrubs less frequently in exchange for his brightly colored sweaters, dress shirts and polos. Here’s a sweater in pasture heather green color by Calvin Klein that is a fine match to the green sweater Dr. Webber is known to wear over a collared button down dress shirt. ​This gray striped dress shirt matches the style of shirt Dr. Webber has been noted to wear. Richard's style is fairly basic and predictable when it comes to his slacks. He has been noted to wear dress slacks or khakis most often. ​The color of his slacks is usually darker in shade, showcasing many shades of blacks and grays. Dr. Richard Webber has been noted to wear multiple different styles of shoe throughout the course of the series. Including but not limited to black oxford dress shoes and black slip resistant work shoes. ​If you wish to complete an accurate Dr. Richard Webber costume, you might want to consider getting a pair like these if you don’t own some already. As I mentioned previously, Dr. Webber was in the past involved in extramarital activities with Ellis Grey; Meredith’s mother. Unlike Ellis Grey, however, Richard was not ready to leave his spouse (Adele) to pursue the relationship completely. ​Ellis and Richard continued to share a special bond during moments of clarity from her Alzheimer's condition. ​This put Dr. Webber through an understandable amount of grief for a time, but he later finds himself falling for the mother of one his most promising proteges, Jackson Avery. ​These half-eye style reading glasses are an excellent match to the spectacles worn by Richard Webber while fulfilling his administrative duties. ​This white lab coat by Dickies is quite similar to the coat worn by him at Grey Sloan Memorial Hospital. ​Dr. Webber’s style may not be for everyone, but it is appropriate for a man of his age without question. Many of the items that are a match to his style are fairly accessible, so if you have any interest in putting together a Dr. Webber costume, then it shouldn’t cause you much grief.